Effective Monday, July 23, Rt 610 Staffordboro Blvd. and Rt 610 Mine Road PM Pick-Up locations will be relocated to the Kiss and Ride areas on North Rotary Road between Corridor 2 and 3 entrances. Due to the current 395 Express Lanes/Eads Street construction project and increased traffic volume observed on surrounding roadways, two slug stations for PM pick-up along Fern Street will be temporarily relocated to North Rotary Road as a traffic mitigation strategy. • Rt. 610 Staffordboro Blvd. and Rt. 610 Mine Road slug stations will be temporarily relocated from Fern Street to N. Rotary Road Kiss & Ride areas on North Rotary Road for afternoon slugging pick-ups. • Rt. 3 Fredericksburg and Rt. 17 Stafford will remain in the same location near Fern St. and the Motorcycle Lot. 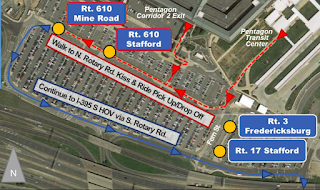 Signage will be in placed in the Pentagon South Parking areas to direct slugs and vehicles to the temporary locations. Please see attached map for the temporary locations and vehicle/pedestrian navigation on the Pentagon Reservation. Please follow signage and traffic control direction. If you have any questions, please contact the WHS TMPO at 571-372-7124 or whs.pentagon.em.mbx.dod-shuttle-bus@mail.mil.